Come November, the RoadAbode Crew gets a little melancholy. Late fall means getting ready for all the exciting things happening to celebrate Thanksgiving, Christmas, & the New Year. We get to see friends and family over the holidays, and prepare for special services and events at Roxborough Church. But even though we are enthused for all the joy occurring during the season, for us November also means the last RVing trip of the season. Our tradition is to put RoadAbode to "sleep" from the end of November to mid-March. The winter months are just too busy for our family, and too cold for our bones in the Mid-Atlantic United States. There are a few things needed to be done in the mid-eastern US to protect an RV over the winter months. 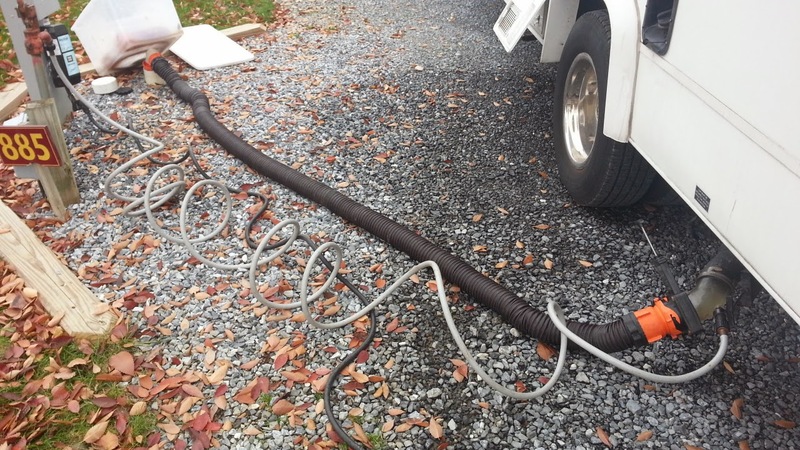 The process includes draining tanks, prepping the water heater, getting special antifreeze in the water lines, checking the roof and a few other things to protect our home on wheels. One year we winterized too late and fortunately only lost our kitchen faucet to a hard enough freeze. When reviewing our process, understand that each manufacturer is different, and valve locations and processes can be dissimilar to what we do for RoadAbode. It's best to check with any owner manuals and manufactures directions you have. This list should give you a good starting point of what needs to be done to keep on RV "in the pink" over the cold months. Here's a look at our process for making sure RoadAbode is snug over the winter. Each year our last November RoadTrip is usually to Country Acres Campground in Gordonville PA. We've written about Country Acres as one of our top spots in the past. Since we don't have adequate connections at storage or home to winterize, the RoadAbode Crew selects this RV park for a few reasons that help in the winterizing process. We make sure the campsite we select has full hookups and is level. This helps with flushing out the black (sewer) and grey (waste-water) tanks. We select a site close to the restrooms. Country Acres has modern and very clean restroom and shower areas, and an added bonus are heated floors. This really makes us happy on brisk November mornings! We can stay till 2pm. This is still a family outing, so don't winterize until our departure day. It's great having plenty of time to finish the winterizing process. Some campgrounds want you to leave by Noon or 1PM. The extra hour or two let's us still enjoy our morning, and maybe a quick shopping trip or quick adventure out. The views are great. We're still RVing, so even though some would think of this a working weekend, for us it's all part of the adventure of owning a motorhome. In reality the work is only a short time of our weekend, so we like to make the most of it. Country Acres is right next to beautiful Amish farmland. If we pick the right weekend, the farmer and his team of horses will be tilling under his fields for next years crop. It's interesting and beautiful to be in Lancaster in the fall! Even when working on winterizing, we try to enjoy as much of our weekend as possible. We wait to do the work of winterizing until Sunday, preferably late morning. When we work together, it takes no more than an hour and half. Before that time, we are out enjoying all the shopping, flavors, and sights of Lancaster County. We start by emptying all our tanks. The process is pretty simple. Since we are working with sewage and waste-water, and items that touch these products, we always wear rubber gloves when working with the hoses and connections to these tanks. The Black and Grey tanks have individual gate valves with manual pull handles. The two connect together at a built in wye connector. We use a "Flush King" clear fitting that has it's own gate valve, and a connector with a ball valve to turn on/off a connector to a water hose. The water hose connector also has a built in back flow preventer, which is important so you don't accidentally contaminate your water supply. We do not use our white fresh water hose for this job, so there is less danger of cross contamination. We use a gray-colored water hose so that there is a distinct differentiation between the two This is important for keeping our fresh water sanitary - all our fresh water connections and our waste or sewer connections are stored in separate bins.We connect our expandable sewer hose, one side to the Flush King, and the other to the campsites sewer connector. We like the Rhino flex hose because the connectors are easy to grab and lock together, and the hose is sturdy and built to last. Once everything is connected, wee open the gate of the black first. Once we see the black tank is not releasing any more waste-water, we do an extra back flush (or sometimes two) of water from our gray hose to help clear the tanks of any solids clinging to the inside walls.We rarely have issues with our sewer tank, as we flush it out once almost every trip. After the black tank is complete we close it's gate valve, and we repeat the process with the gray water. For the fresh water tank, we access valves under our rear queen bed. These valves allow the fresh water tank to empty from underneath RoadAbode. Depending how much water is in the tank, the process to empty the fresh water can take a few minutes to an hour. RoadAbode has a six gallon water heater. Preparing it for winter is a two step process, but relatively easy. The water heater is located under the kitchen area sink. First, we go outside to the access panel, twist the spring clasp (which oddly looks like a flip-top from a soda can) and lower the access door. We use an adjustable wrench to open the nylon drain plug. I recommend picking up a pack to have as backup, the spot is tight and I seem to mess up the head of the plug after a few times emptying the tank throughout a season. To quicken the release of water, I flip up the release on the hot water pressure valve and open the hot water faucet in the kitchen. Both let air into the tank help displace the water. Once empty, I close the faucet and pressure release valve, and tighten the water heater plug back in place. Close the access panel, and on to part two under RoadAbode's kitchen sink. First I have to open the access panel underneath the sink. Once this is lifted out of the way we can peek past the "house" heater duct work and see a single plumbing valve. I set this to the "up" position, which is important for our next part in winterizing. The valve causes any water in the pipes to bypass the water heater. Once we are finished our next set, I reset it back so that the water heater will be ready for use when we de-winterize in spring. As a reminder, I just lay the access panel to the side for now. 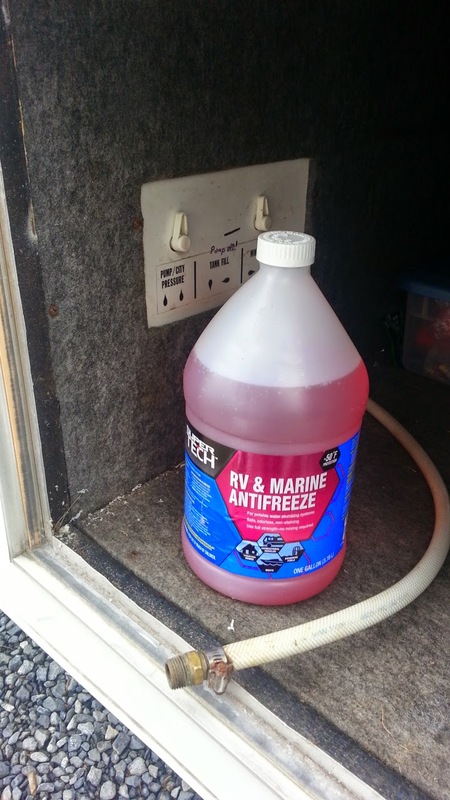 Important safety tip - RV antifreeze we use is specially formulated for fresh water systems. Never use vehicle coolant/antifreeze in your fresh water or waste water systems! Even small amounts of the wrong stuff can make someone sick. No matter what you read in a RV forum or some RVing old-timer (and I think I'm actually an old-timer!) tells you about using automotive antifreeze, don't. Not good for the environment, not good for septic systems, not good for pets or people, and it's not even cheaper! We are fortunate to have a setting on our water control panel located in the road-side basement, allowing us to add RV antifreeze right from the jug! 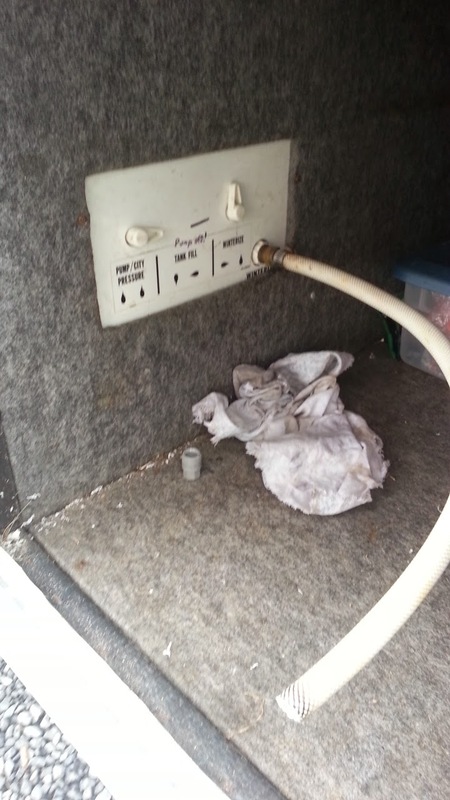 Some RV's have to use a second pump or hand pump antifreeze through their fresh water inlet. Whichever way it needs to be done, the importance is to displace any water in the system with the "pink stuff". Fresh water antifreeze is a bright pink. You won't confuse it with the neon green of automotive antifreeze. With RoadAbode, we open the basement door, flip the valves to the correct position, and connect the "feeder tube" to the winterization inlet on the water control panel, it's other end goes into a bottle of RV antifreeze.. Then we go inside, flip the pump switch on, and open faucets one by one until the water coming out is bright pink. We do this for our kitchen, shower, and restroom faucets - hot and cold, and the toilet. We shut off the pump, and retrieve the bottle of RV antifreeze from the basement. Into each drain we pour some of the antifreeze to displace any water in the drains "P" traps. Last job of the "pink stuff" is to pour some into the toilet and let it sit in the bowl. Before we close up for December through March, we do a few other items to keep RoadAbode happy and safe. Check and Disconnect the Battery - We have a knife switch (a quick disconnect on the pole of the battery) on RoadAbode's house battery that we disconnect. We do this every time we go to storage after a trip. On our last trip, we also look for any corrosion, or if the battery is leaking. So far, we're in 10 years we are on our second house battery. Have Service Done on RoadAbode's Chassis - Pennsylvania requires a state inspection, so we usually take RoadAbode in October or November for this annual checkup. Besides the state inspection, we have an oil change done, and all fluids checked or replaced as needed. All hoses and belts are checked. We take RoadAbode to a shop that specializes in truck repair, so they can put her on a lift and check her underbelly and suspension. Clean - I'd be remiss in not saying that we give RoadAbode a through cleaning before heading back to storage. We take all the rugs out, (matching, various size bath rugs with rubber bottoms are perfect for us as area rugs) sweep the vinyl floors and clean all inside surfaces. All bedding come home to get cleaned. Any stored food items (we always have extra snacks!) are removed and carted home. It's almost sad RoadAbode's so barren! Cover RoadAbode's Tires - When she's finally back in the parking spot in storage, we put wheel covers on RoadAbode's wheels to keep the sun and weather off them. This helps keep the tires from prematurely aging, and having the chemicals in the rubber leach out. For now, RoadAbode is all set for winter. December through March, we visit, perhaps do a few update projects, run her engine and generator a few times, and shovel snow if there's a lot. Mostly though we dream and plan for our next RVing adventures come early spring! We enjoy our RVing lifestyle! Below are some of the products we mentioned while winterizing RoadAbode. If you click on the Amazon links below and purchase, the RoadAbode Crew get a small commission and you pay the same price. These are items we use in keeping RoadAbode healthy and fun to be around. Read our disclaimer for more info. If you can use anything below - thanks in advance for helping us out.